Cherry Garden entrance, originally uploaded by Camemberu. OK here comes another bumper post like Kikuzawa! 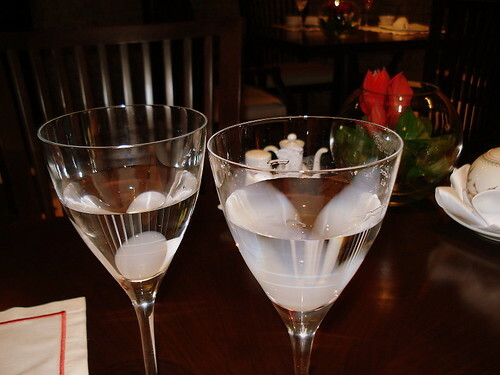 Yesterday for lunch we indulged ourselves at The Oriental Hotel's Cherry Garden a la carte dim sum buffet. It's a posh place, decorated elaborately in dark wood with intimate lighting. Here you get served by gentle, soft-spoken waitstaff who fade in and out to attend to your needs without disturbing your meal. Table setting very aesthetically pleasing. 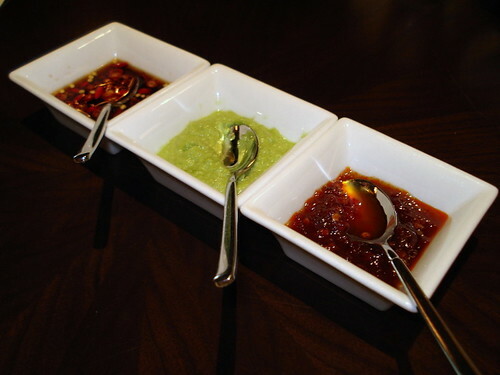 Condiments presented neatly in a row - sliced chili in soy sauce, a garlic-ginger paste, sweet-hot chili paste. A small appetiser of braised peanuts heralded the portions of things to come. Imperial hot and sour seafood soup, originally uploaded by Camemberu. We began with soup. 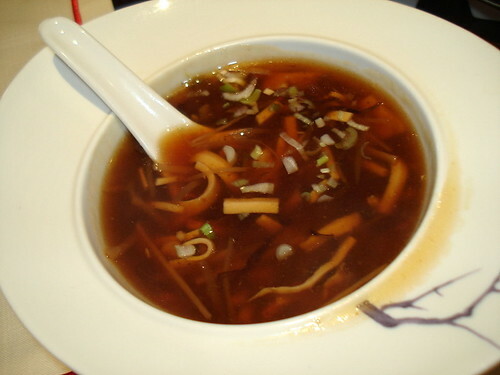 This hot and sour soup tasted a tad too vinegary at first, but it did well to whet the appetite. The ingredients were sliced fine but still retained some crunch. The stock is flavourful enough even though watery (they didn't use too much thickener, which is good). Portion just large enough for two to share (well, we didn't want to get full up on soup!). 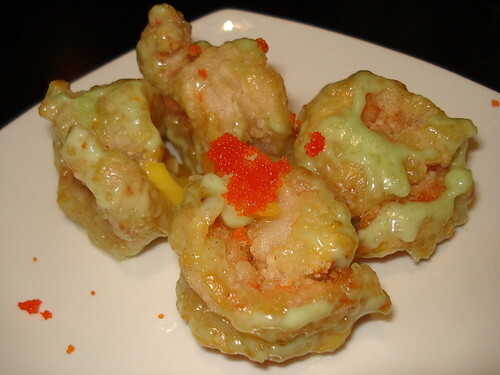 Crispy wasabi-aioli prawns topped with fresh mango, originally uploaded by Camemberu. First main item to arrive was the crispy wasabi-aioli prawns from the Specials section of the menu (you can only have one order per table of Specials and Appetisers). This was good, nay, superb! Both the batter and prawns were crunchy and well-seasoned - every bite was fragrantly savoury. Not too fond of the wasabi mayo but lucikly it was not overpowering. 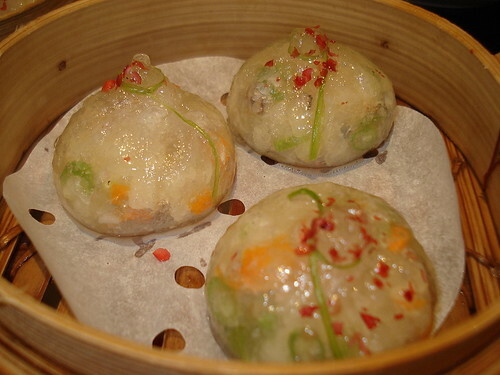 Steamed pomegranate dumpling of diced vegetables and pistachio, originally uploaded by Camemberu. This was also another favourite of mine. Very pretty dumplings! The tasty diced vegetables beckoned from underneath the translucent skin. 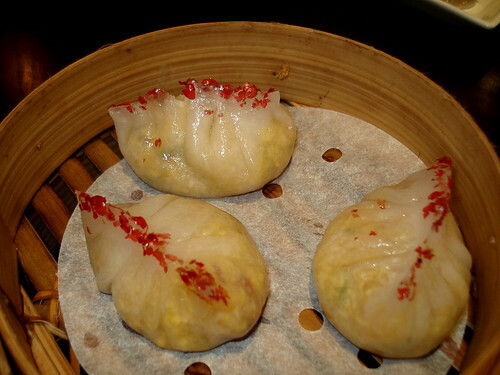 They tasted like very healthy sui jing baos (crystal dumplings). I must say the dim sum offered at Cherry Garden are not your usual run-of-the-mill varieties. I'm glad they try to innovate. Although a purist at heart, I do sometimes like to see new twists given to age-old stalwarts. Chicken dumplings, originally uploaded by Camemberu. Now we didn't order this. But it came and we didn't mind trying since it looked cute and was different from all the shrimp dumplings we had coming. Oh man, what a disaster it turned out to be! Hubby thought they used horrid pre-made commercial seasoning like the Knorr chicken cubes or something. Yuck. I think this made us avoid ordering any dim sum with chicken in it (including their siew mai). Wok-fried beef cubes with sweet and sour sauce Cantonese-style, originally uploaded by Camemberu. I wasn't sure how beef would turn out with sweet and sour sauce but this was a winner! 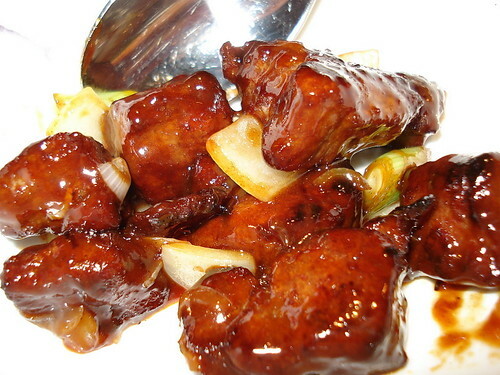 Amazingly tender cubes of beef in a delicious sauce with wok hei. Hubby thought this was brilliant. Just really good cuts of beef given the right treatment. This was also from the Specials menu. Man, it's so tender, if you brought your grandparents and they forgot their dentures, they'd still be able to enjoy this dish! 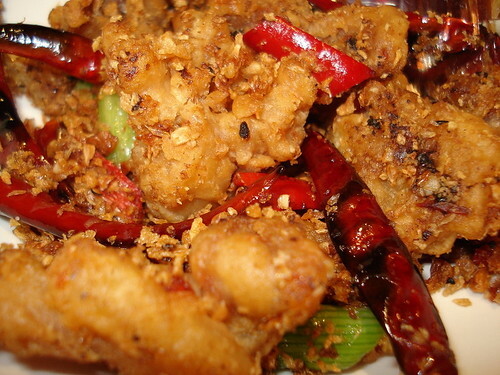 Pi fong tong style wok-fried chicken with garlic, shallots and dried chili, originally uploaded by Camemberu. From the menu description (chicken+dried chili), I had thought this might be closer to kungpao chicken but I was pleasantly surprised by what arrived. The chicken was fried til crispy, along with crunchy bits of batter, garlic and shallots. It tasted more like cereal prawn, i mean chicken. Hubby and I were divided on this dish. He didn't like it much, but I found it all right, quite tasty even. Also from the Specials menu. Again, thanks to TTC, I learned that this is a take on pi fong tong style crabs that are very popular in Hong Kong. Normally the dried chili is crushed to the same size as the crispy garlic bits instead of large strips like above. Oh my, to eat this with tiny bits of chili - that would have been spicy heaven! 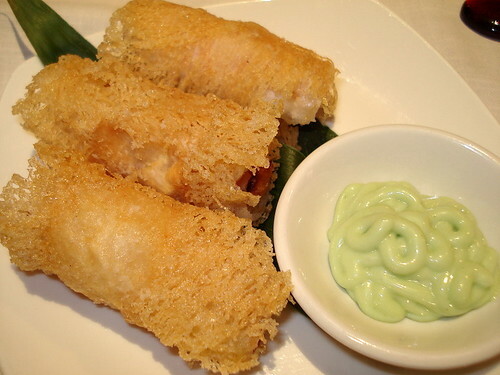 Pan-fried beancurd roll with shrimp, originally uploaded by Camemberu. Beancurd skin wrapped around shrimp is one of my favourite dim sum items, and I almost always order it anywhere I go. The Cherry Garden version did not disappoint. 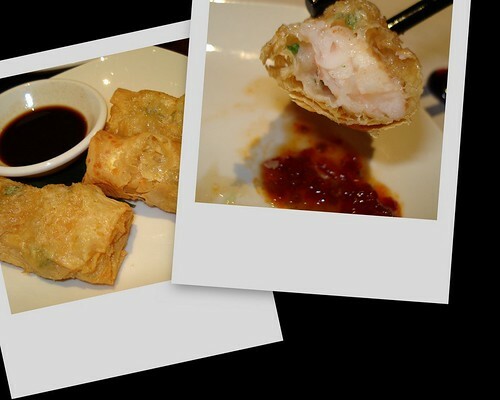 Hearty portion of succulent prawn inside crispy thin beancurd skin. Good on its own or with chilli sauce. 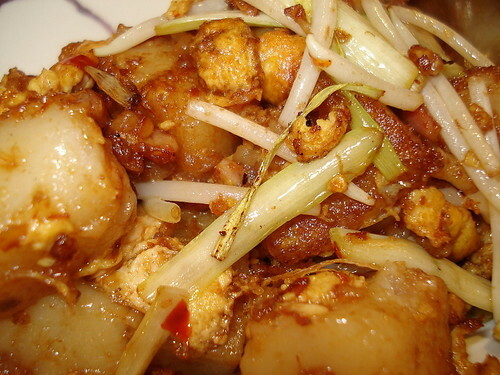 Wok-fried radish cake with silver sprouts in XO sauce, originally uploaded by Camemberu. This simple dish was also from the Specials, of which you are only entitled to one serving. I guess XO sauce must be expensive. Well, the radish cake was very soft and mushy (another ideal dish for grandparents without dentures!). You can taste the radish quite well and it was a good marriage of starch and seasoning. My first mouthful was sublime. Yum. Hubby who likes his food spicy and strong-flavoured found this dish too subtle and bland for his taste (at first bite). However, he later admitted it grew on him (he was the one who polished it off). 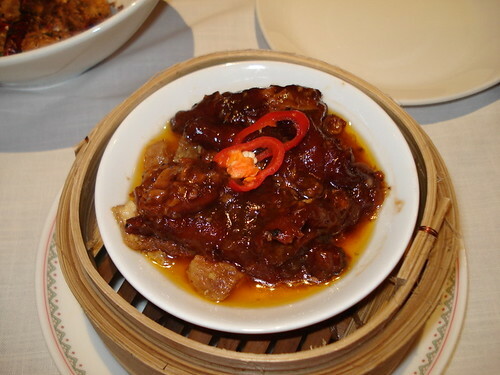 Steamed chicken feet with chili black bean sauce, originally uploaded by Camemberu. OK where the radish cake was too subtle, this was too strong. Salty and greasy but still edible. I tend to like to chew/eat the cartilage bits off the ends of the tiny joints but somehow I wasn't able to pry these off as easily here. Interestingly the chicken feet sat on some sliced tau pok (fried beancurd) which almost resembled mock roast pork. Steamed dumplings with dried scallops and shrimp, originally uploaded by Camemberu. The shrimp dumplings with dried scallop looked and sounded more tasty than they were. A little bland, but I'm not sure if that's because my tastebuds were numbed by the strong flavours of the black bean chicken feet and the wok-fried beef. But damn, looking at them again, I feel like eating some more! I'm a sucker for good presentation. 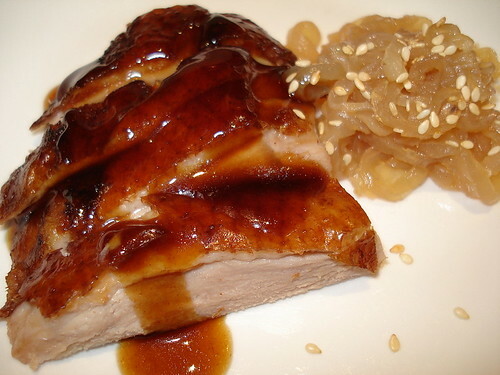 Hong Kong style roast duck, originally uploaded by Camemberu. Now I'm not a fan of duck at all but I heard this was good here. Indeed, this is the best roast duck I've had in years (then again I haven't had roast duck in years!). Anyway, it's light, sweet and fragrantly smoky without any offensive gamey smell that so often accompanies duck. The sauce is most complementary. Duck skin not crispy as purported elsewhere but delicious nonetheless with the soft lean meat. This is from the Appetisers menu, of which you can only have one portion. You must have this if you come here. Goes really well with ee-fu noodles too! 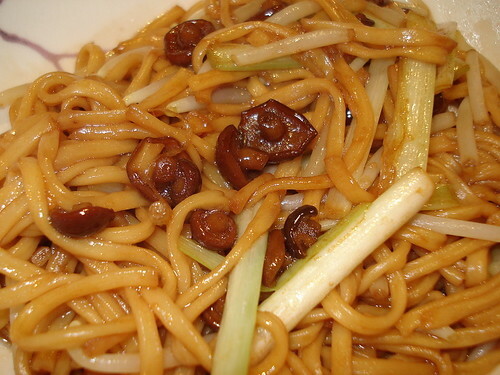 Braised ee-fu noodle with nameko mushrooms, bean sprouts and yellow chives, originally uploaded by Camemberu. Oh I love ee-fu noodles and I love nameko mushrooms! But even they couldn't save this bowl of noodles. Somehow it was a bit too watery and it's as if the noodles didn't seem to have much chance to soak up the flavours of the stock. I prefer my noodles a bit more gooey. But on hindsight, this was a much healthier way to prepare ee-fu noodles. It had none of the greasiness that so often is a trademark of this dish (especially gooey versions). Probably saved me from a bout of indigestion! 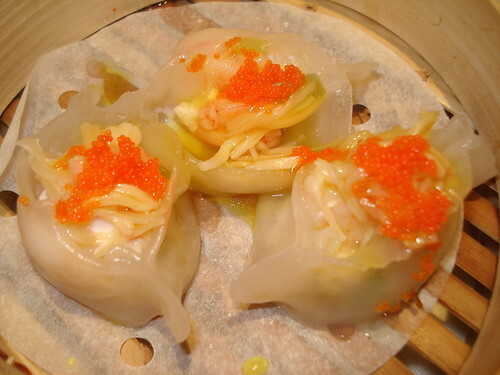 Crispy shrimp dumpling, originally uploaded by Camemberu. Maybe it was the type of dim sums we ordered (too many shrimp-based ones!) but most of them tasted just alike. The crispy shrimp dumpling was not too remarkable although I give the chef marks for being able to retain a juicy filling inside the fried crust. Yes, it was almost like biting into a xiao long bao, with hot juices bursting out as I sank my teeth in. 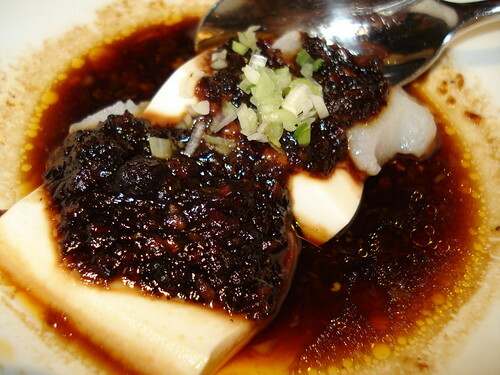 Steamed fish fillet with silken tofu in black bean sauce, originally uploaded by Camemberu. This came really piping hot and the picture you see is the *full* portion (about two tablespoonfuls). Miniscule, to say the least, and it was more tofu than fish. The tiny pieces of cod fought valiantly taste-wise with the black bean sauce...and they won! That's some strong-tasting cod! This dish was competently done but not a favourite of mine, so I didn't mind the tiny portion. This was our last dish from the Specials section. 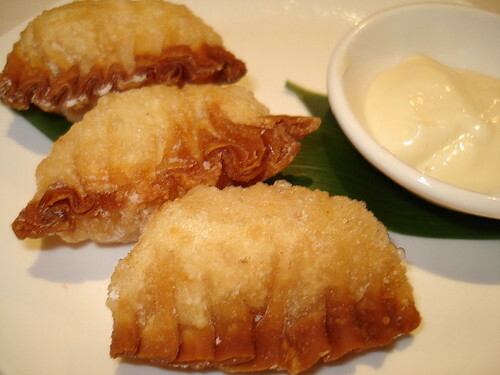 Crispy turnover stuffed with shrimp, apple and mango, originally uploaded by Camemberu. By the time this came, we were quite surfeit from the many dishes we'd already had. I felt there was not enough apple or mango in this crispy turnover. The timid taste of the fruit did nothing to enhance or differentiate the snack, so it really tasted like just another shrimp dim sum (oh no, not another one!) The squiggly green blob you see there is not some light-headed Martian's brain but wasabi mayo (probably the same thing that coated the crispy prawin in the first course). cherrygarden-desserts, originally uploaded by Camemberu. 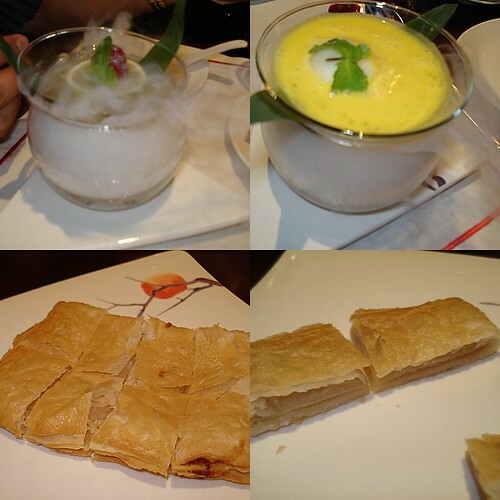 Top left pic - The Chilled Lemongrass Jelly with Aloe Vera Flavoured in Lime Citrus Jus: now this was Miss Exotic! There was this smoky sweet herbal infusion that at once blended with the rest and yet reared its own head up like a prima donna for attention. Thumbs up for a delightful surprise for the tastebuds but I can imagine this is a "love-it or hate-it" concoction. Top right pic - Cream of Mango on Lime Sherbet with Sago: tangy lime drowned in overly rich mango. Made me yearn for pomelo with mango instead. Bottom two pics - Fried pancake with lotus paste: lacklustre. I generally like my desserts less sweet but this one was ridiculously bland. 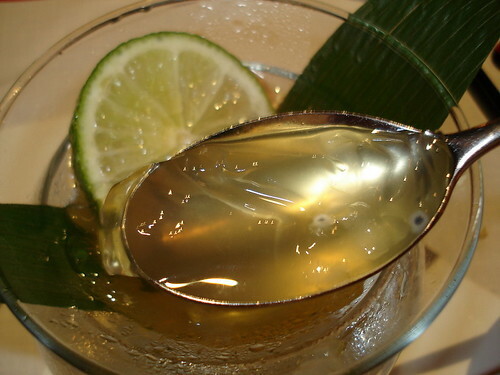 Lemongrass jelly with aloe vera in lime juice, originally uploaded by Camemberu. A scoop up close of the lemongrass jelly dessert. 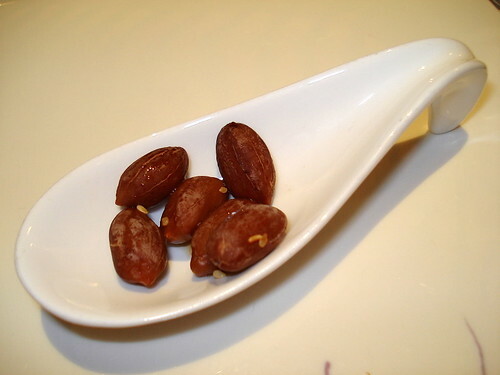 Yes there are a bit of the "buah selasih" seeds (sometimes nicknamed "tadpole seeds" for their appearance). You can barely see the almost transparent, small pieces of aloe vera too. For best flavour, mash the slice of lime given to add more tang to the dessert. Did I mention we had two helpings of this? Hubby loved this! Handmade glasses, originally uploaded by Camemberu. So ended a long and leisurely lunch. All in all, I really enjoyed myself. It may not have been the best dim sum I've had but it was certainly the best dim sum EXPERIENCE. The lovely ambience and service contributed a lot, even though I generally care more for food than surroundings. It also helped that the food was quite light in general, so you don't get that sick "jelak" (satiated) feeling even when you are full. Would I come back? Yes. Somehow I feel like I haven't quite fully explored the dim sum side of things at this place. I think on hindsight, we were not terribly adventurous and didn't try the dim sum that sounded too far from the familiar. But if I do come back, it will probably be on a normal a la carte basis than buffet. At S$38+++, it is not cheap. 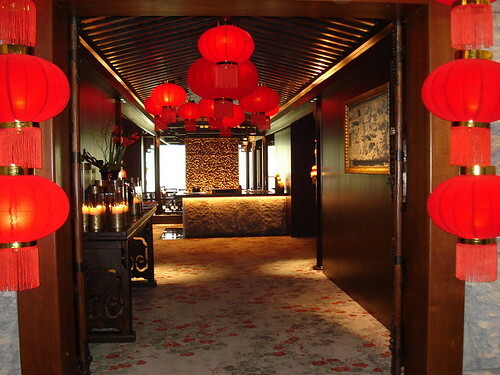 If you come with a smaller appetite and just for dim sum, two persons can have 15-18 plates for the same price! But the specials, appetisers and desserts in addition to the dim sum, make it worth every cent. Ha. this looks like the real deal. Exquisite dim sum, but price really on the high side. how much is the a la carte price range like? well, mayb have to wait until i strike it rich, or someone treating den. Lol!